A major trend in embedded industrial applications is toward integration – operator interfaces, real-time control, data acquisition, modular I/O, and network communications now tend to come in a single compact, easily programmed package. State-of-the-art board-level embedded computers must do it all – deal directly with sensors and actuators, implement control and analysis, interact intelligently through a front panel, and serve out data to a network. Choose among our core computer products for the one best suited for your application. You may need a single board embedded computer or an operator interface with touchscreen and graphic display. Choose among mix-and-match expansion I/O modules called WildCards that will best suit your needs. The Wildcards implement a wide variety of user interface, communications, data acquisition and control capabilities, including a GPS tracking system, octal 12-bit D/A and 16-bit A/D converters, a 24-bit resolution analog data acquisition subsystem, a Compact Flash card mass memory interface, a fast buffered RS232/485 dual UART, high voltage/high current isolated I/O, AC or DC solid state relays, and a budget character display/alpha-numeric keypad interface. 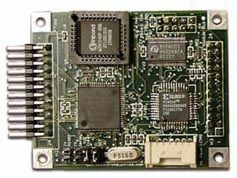 Consider adding embedded Ethernet or WiFi communications to the instrument controller of your choice.Turn your instrument into an embedded webserver by adding Mosaic's EtherSmart Wildcard, or a WiFi Wildcard. The EtherSmart/WiFi Wildcards implement a dynamic webserver that accepts connections from your web browser, serving out static or dynamic web pages. Give us a call - our friendly, knowledgeable application engineers will help you specify the core components best suited to your new product.